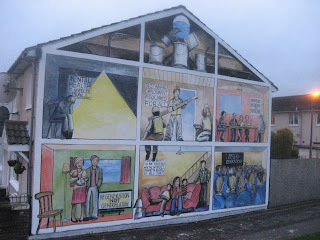 The Committee recommends that the human rights framework, including the Equality Impact Assessment, be effectively implemented in Northern Ireland, particularly in the context of urban regeneration programmes by ensuring the participation of the affected populations and the development of adequate policies and targeted measure to promote substantive equality, provide for improved health care, as well as increase in skills training and employment opportunities for young people and adequate housing programmes for the poor and, in particular, Catholic families. There are other recommendations specific to mental health, housing inequalities and child poverty in Northern Ireland for your reading pleasure once the final version is posted. Now, it's time to make sure these recommendations are implemented. This is the issue that was highlighted by Vice Chairperson Virginia Bras Gomes at the UN on Tuesday. You can download the report here. Today at the UN, I was very pleased. One of the members of the committee, Ariranga Pillay, had asked the UK government the question I had put to him as important to me and my group. My question was about the inequality of social housing provision in North Belfast, especially for Catholics and Nationalists. Unfortunately, the UK government was not able to respond because there was no one from the Northern Ireland Office in Geneva to answer. I found this especially disappointing with all the groups there, bringing Northern Irish issues to the fore. But as a person with mobility issues, there was a further disappointment. 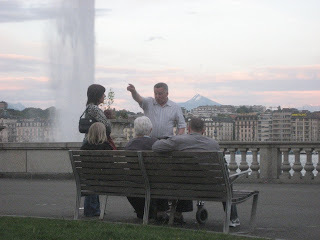 It was quite shocking about the lack of human dignity in the treatment of anyone with disabilities in Geneva. For example, in the hotel, the only way I could get down the stairs was in a dumb waiter! It was humiliating to have everyone watching. Overall, though, the trip was a great success and very enjoyable and educational. Our issues were considered and even raised! The trip was not in vain! We've uploaded a one minute video (below), giving you an idea of some of the full interviews that will be uploaded later in the week. It also lets you see some of what the Palais Wilson (where the Office of the High Commissioner on Human Rights is located) looks like. Thanks to all the organisations who have participated in the interviews. It was very generous of you to give up your time. If you're just joining the blog, we'd love for you to watch our movie trailer for the blog at this link to get an idea of why we're here. For more information about CESR and their report on Cambodia visit their blog. Today was the first day of the evaluation of the UK Government, and I thought it was at times both excellent and disappointing. The highlight of the day was when Virginia Bras Gomes, the Vice Chair of the Committee, asked a question that was specific to one of the groups from North Belfast. 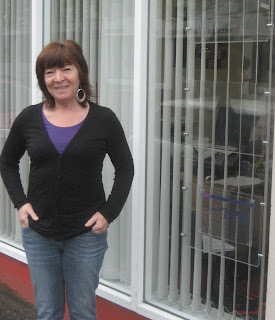 She connected the issue of urban regeneration to the regeneration of Girdwood in North Belfast. She talked about her experience with the Residents’ Jury when she came to Northern Ireland last year. But, most important for us, her question related to all of our groups. She asked how the British Government would make sure groups like ours could participate in a meaningful way in issues that affect them. She wanted to know if the government thought participation and human rights were integrally linked. We also got a great opportunity to talk to the Algerian member of the Committee Mr. Azzouz Kardoun. He said he was really impressed by the strength of the organisations that were attending the meeting. The most disappointing part of the day came during the British Government’s introduction. We learned that there were no representatives from Northern Ireland in attendance. They had planned to be there, but they canceled at short notice. Regardless, it was disappointing, especially as there are so many Northern Irish groups here in Geneva. Although tomorrow is our last day here, we are looking forward to trying to make sure issues around mental health and housing in Northern Ireland are brought up by the Committee. Angie will be posting to let you know how it all goes. If you're around, listen to Gerard on CityBeat tomorrow morning from 6am. A few blogs have picked us up as well, here and here. If we're missing anyone, let us know! We got up early this morning. After breakfast, we shot off to the Palais Wilson to meet with members of the Committee on Economic, Social and Cultural Rights. First, we caught up with Virginia Bras Gomes, who had visited North Belfast in May of last year for the Residents' Jury hearing on the regeneration of Girdwood. She brought with her Eibe Riedel, who was particularly interested in mental health issues. We spoke to them for about half an hour, going over the issues we wished them to raise with the British government. We then made other arrangements to meet the rest of the committee in the afternoon where ourselves and other organisations who are working on human rights tried to make sure the right questions were asked. I was most impressed with the numbers of committee members who attended the briefing by the different organisations, and quite a few showed a great interest in our issues of mental health, employment, education, housing and children's right to play. Now, we're looking forward to tomorrow when the committee will be quizzing our government on issues important to the people in North Belfast! It was nice to hear that there was interest in our trip to the UN from both CityBeat and the Belfast News Letter. There's a lack of awareness of human rights generally and of economic and social rights in particular in the UK. There's a lack of way to make sure people whose economic and social rights have been breached to make sure that their problems are fixed. The UN Committee needs to remind the UK and devolved governments of their human rights responsibilities. Currently politicians seem to think the question of whether economic and social rights are implemented is a matter for them to decide. The UK Government needs to agree a framework for the implementation of economic and social rights as recognised by the UN. The UK Government needs to be held accountable for what is presented in the UN Committee's "Concluding Observations". This needs to be accessible to everyone. These were developed with help and co-ordination from the Scottish Association for Mental Health. We spoke with two organisations working on gender issues in Scotland today. The interviews took place outside Palais Wilson with both Engender and the Scottish Women's Budget Group. We look forward to posting more interviews tomorrow and Wednesday as we get more footage. Look forward to interviews with members of the Committee, with Northern Irish NGOs and with the Center for Economic and Social Rights. The full post includes a picture of the members of the Human Rights Consortium who are here in Geneva. The UN Committee on Economic, Social and Cultural Rights – These 18 people are why everyone else is here. They come from around the world and from many different backgrounds. Click here to see a list of the people on the committee and to find out where they’re from. The UK Government – These are representatives of the government being examined. The representatives are often civil servants working in England. There are usually representatives from the Northern Ireland Office as well. Non-Governmental Organisations (NGOs) – These are human rights organisations – like PPR and groups like us – anti-poverty organisations, trade unions and more. These organisations usually want to make sure particular issues are emphasised during the process. The other groups from Northern Ireland here are CAJ, NICEM and the Human Rights Consortium. Human Rights Commissions – These are non-departmental government bodies in charge of making sure human rights law is followed. The Northern Ireland Human Rights Commission (NIHRC) is here representing Northern Ireland. We hope to be able to report on how all this works together. We will try to post interviews over the next few days with different people who you might be interested in hearing from. It’s been a long old day and we’re all very tired. On the bright side, the weather has been gorgeous! Once we got in, we went out for a late lunch / early dinner and sat outside. We couldn’t believe the prices here (way too dear! ), nor the temperature (perfectly warm at 9pm). Perhaps the nicest part of the night was the walk after dinner. There’s an absolutely beautiful fountain in the middle of the lake near our hotel. And Angie found a statue of Lady Bracknall. For the end of the evening, we sat in a pub and got ready for our questions and lobbying in the morning. We plan to have an early night to be fresh tomorrow. Wish us luck! Seven hours of traveling condensed into 90 seconds. Hope everyone enjoyed their weekend! If you haven't seen our movie trailer for the trip click here or scroll below. And if you have any ideas for posts, questions to ask the UN, send us an email. We will be posting a copy of our brief for the UN Committee tomorrow. Where, after all, do universal human rights begin? In small places, close to home - so close and so small that they cannot be seen on any maps of the world. Yet they are the world of the individual person; the neighborhood he lives in; the school or college he attends; the factory, farm, or office where he works. Such are the places where every man, woman, and child seeks equal justice, equal opportunity, equal dignity without discrimination. Unless these rights have meaning there, they have little meaning anywhere. Without concerted citizen action to uphold them close to home, we shall look in vain for progress in the larger world. Photo used under Creative Commons license. From Flickr user shinyai. What’s important about the International Covenant on Economic, Social and Cultural Rights (ICESCR)? The ICESCR and the rights it contains are the basis for almost all PPR’s work. The Covenant contains the right to housing, health, employment, education, social security, leisure, the right to join a trade union, and equal rights for men and women to enjoy economic, social and cultural rights. The Covenant was ratified by the UK government in 1976 which commits them to upholding the contents of the Covenant for all people in the UK. What does the UN’s Committee on Economic, Social and Cultural Rights do? The UN’s Committee on Economic, Social and Cultural Rights is a committee made up of 18 human rights experts. They come from all over the world and they decide whether or not governments are fulfilling their commitment to ensure the rights in the Covenant are made real for all people. The UK has to submit a report to the Committee on Economic, Social and Cultural Rights every five years. This report should detail what they have done to make each of the rights real over the last five years. After the report is submitted, the Committee then draws up a list of questions for the government, including asking for more information on the points that seem the most important. It draws the government’s attention to what the committee thinks might have been left out. The government then responds to these questions in a written form. Where does this blog come in? The final stage is the examination of the government by the Committee in Geneva, Switzerland – the place where the Committee sits. This usually takes 2 days, and the Committee members are able to ask a team of representatives of the UK government about their report. The community representatives are travelling to Geneva to make sure their views are heard throughout this process. They want to ensure that those examining the UK government are made aware of the lack of change occurring in the most deprived areas of Northern Ireland such as in North Belfast. They group will lobby the Committee members to persuade them to ask the right questions of the UK government. They will draw attention to the lack of participation of the most affected groups in decisions that affect their lives, and highlight longstanding inequalities in health and housing. 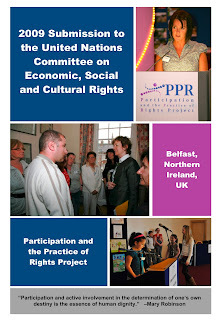 If participation in public decision-making is the key to human dignity and human rights, as Mary Robinson once said, then we want to make sure the Committee reiterates this and provides something useful to communities here in Northern Ireland and across the United Kingdom. For more information on our recommendations, read PPR’s submission to the UN Committee here. Northern Ireland is lucky that its government collects (and publishes online) a robust set of statistics on social and economic deprivation. This information can be divided up by neighbourhood, by gender, by religious/political affiliation, by disability, by race/ethnicity and more. They have been expanding the service in recent months and it's worth having a look around. Type your street address in and see more information about your area. The above graph is an example of a small bit of the information available. The larger the word, the higher the "multiple deprivation" rating of the different electoral wards in Belfast. Look at the size of some of the wards from North Belfast (Shankill, Ardoyne, Crumlin, New Lodge, Water Works, Duncairn), but also at some of the wards in West and East Belfast (Falls, Whiterock, Upper Springfield, Ballymacarrett, The Mount). The areas of the highest deprivation have remained largely the same over the last few decades. You can use some of the data to create your own visualisations by going to Many-Eyes.com. We'd love to see anything you create using the data on the site. Email us at info@pprproject.org. Download a copy of PPR's submission to the UN here. This includes all the evidence and what we will specifically be asking the UN to do. Or, you can download a short, summary of our submission here. My name is Angie McManus, and I'm an experienced actress and storyteller. I have been working with PPR for a year now in the Seven Towers Rights Group, and am the chairperson of the Seven Towers Residents' Group. 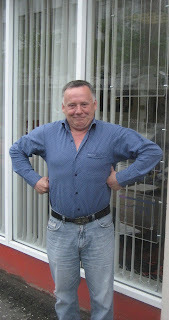 Hi, my name is Bertie Atkinson, and I work with two of the group's PPR is involved with. I am co-chairperson of the Girdwood Resident's Jury which works on regeneration, and a member of the Lower Shankill Residents' Voice which works on children's right to play. 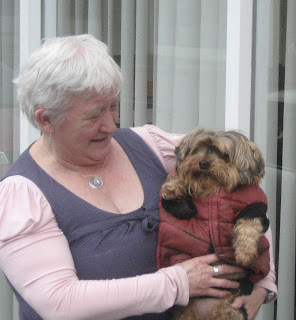 I'm 57 years old, and I have a dog called Touzer who walks me two to three times a day. I used to teach rugby to under 12s in New Forest, Dorset, England and also in Ballyclare. My name is Gerard, and I'm 43 years old. I grew up in Oldpark, North Belfast and have always lived there. I went to St. Patrick Secondary School when I was growing up. I'm a member of the PIPS-Greater Shankill Bereaved Families Rights Group, organised through PPR. And I got involved through PIPS. Hi, my name is Margaret Valente, and I am a member of PPR's Residents' Jury on the Regeneration of Girdwood Barracks & Crumlin Road Gaol. 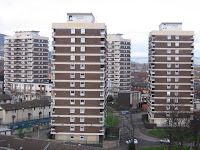 I have lived in North Belfast for the past 25 years and have five grown up children. I spend my time working in the local community at the STAR Neighbourhood Centre. I love my garden and going to walk, and I especially love holidays at the beach. I really like music and dancing, but unfortunately, I can't sing at all. I try to sing sometimes - but usually only on a night out. Today, PPR submitted its report responding to the UK's submission to the UN Committee on Economic, Social and Cultural Rights. As you can imagine, we're happy to get it done and away. You can download a copy of our report here. Or, if you're really interested, read what the UK submitted about themselves here. We'll also soon have a fact sheet up that summarises our recommendations to the UN...in a (hopefully) less long-winded way.